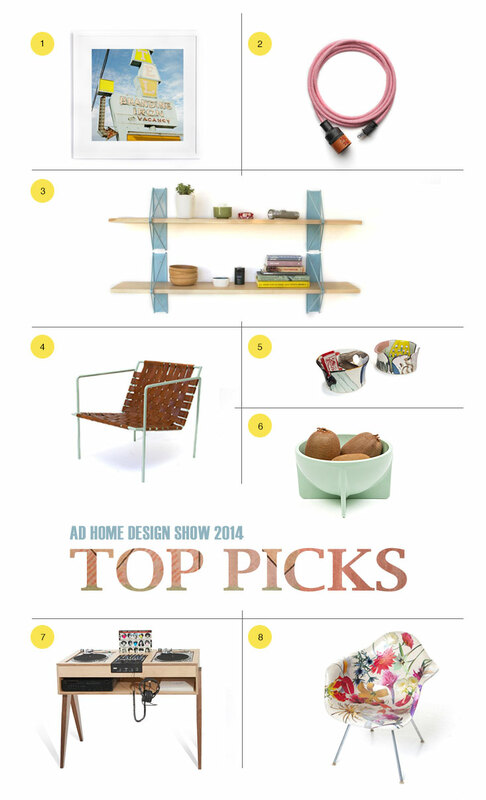 Sunday marked the close of the 2014 Architectural Digest Home Design Show. Man, am I glad I went. I was fighting lingering jet lag and brain-fatigue from two days of Blogshop, but the westward trek to Pier 94 was WORTH IT. I discovered so many talented new designers. I had a chance to see (and touch!) products I'd previously only checked out online. For example, Hygge & West's collaboration with Laundry was even more compelling in real life. Those metallics! And Hudson-based Hawkins NY displayed their wares in a booth so pretty I lost all resolve to temper my instagram'ing. If only I could snap my fingers and transfer the color palette of their booth to my apartment. But ADHDS's biggest draw for me is the MADE section, where AD showcases one-of-kind and limited edition goods by jury-selected artisans. Quality is consistently high. And the booths themselves are so imaginative! In Allied Maker's booth, Sonia Scarr of Love Dart channelled the spring weather outside the convention center with leather-wrapped terracotta planters. Erin Trine whipped up a small powder-coated shelf to display his planters, and added a hook to hang his coat! It wasn't just professionally illuminating-- it was really fun too! I loved chatting with all the fascinating and quirky people that are contributing to the rebirth of the craft culture in the U.S. Textile pattern behind "Top Picks" is Alyson Fox's Landscape Area Rug for Hawkins NY. Once Upon a Time in the West (Twin Falls, ID), Photograph by Travis Schneider, via Tappan Collective - price varies based on print size. And one more! Kith & Kin Shop. The husband-and-wife team from VA makes an awesome patchwork console. Fingers crossed I can find a spot for it in a clients' home. PS What do you guys think about the new template? Snazzy new photoshop skills courtesy of Blogshop! 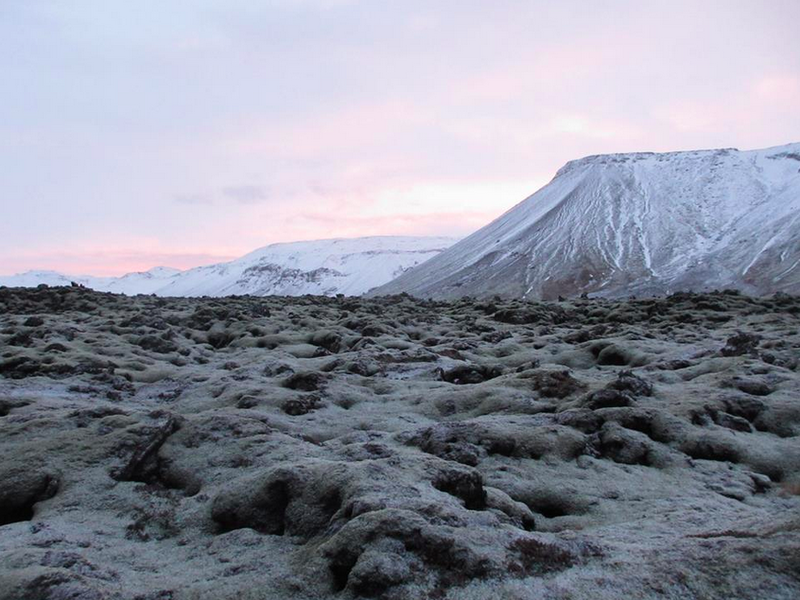 Over the Thanksgiving holiday, I hopped a flight to Iceland with three friends. Late-November is far from tourist season in Reykjavik, so we scored good deals on airfare and accommodations. 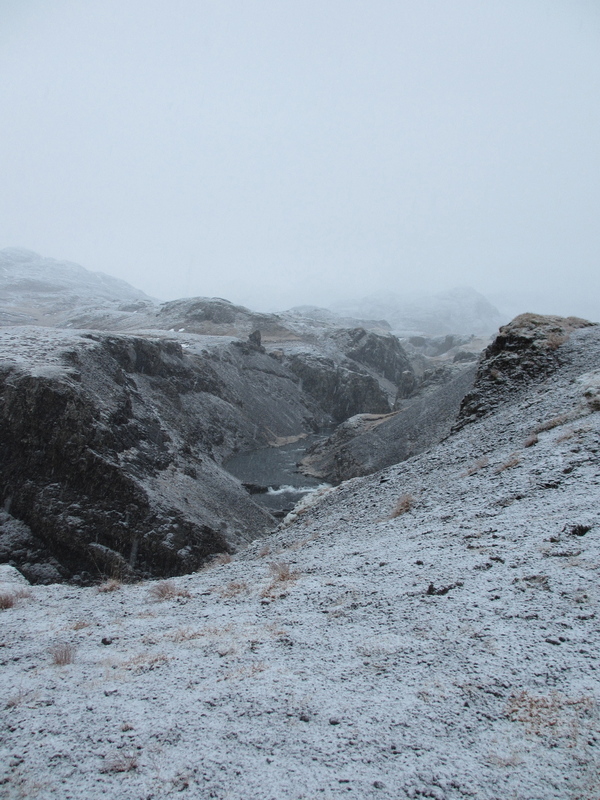 The weather in Iceland is always fickle and unpredictable, but especially so in winter. We saw blizzards, hail, sleet, rain and sun all in a 30 minutes span. Wind that practically knocks you to the ground. Oh and, yes, there's only about 5 hours of sunlight a day. Ever wonder what an 11am sunrise looks like? Now you know. With the exception of a few other Americans piggy-backing on the 4-day weekend, we didn't run into too many tourists. Unusual for a country that calls tourism it's #1 industry since their 2007 economic troubles. Before 2007, tourism was only third, trailing fishing and software engineering. Iceland is a real travel hotspot these days, thanks to Iceland Air's 'free stopover' policy and their ads on the NYC subway (you know it's true), so we were lucky to find compelling deals for November travel. I'm excited to share with you a few highlights from our winter adventure! Iceland has many famous waterfalls (Gulfoss and Skogafoss, to name two) that are far larger and more dramatic. 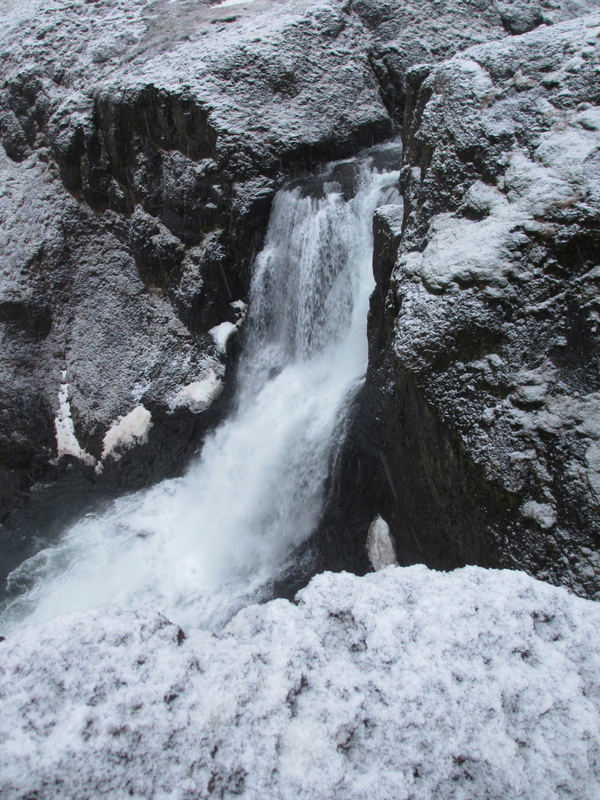 But the waterfall we visited with a private guide had the advantage of being completely secluded. We were the only people around for what felt like hundreds of miles. 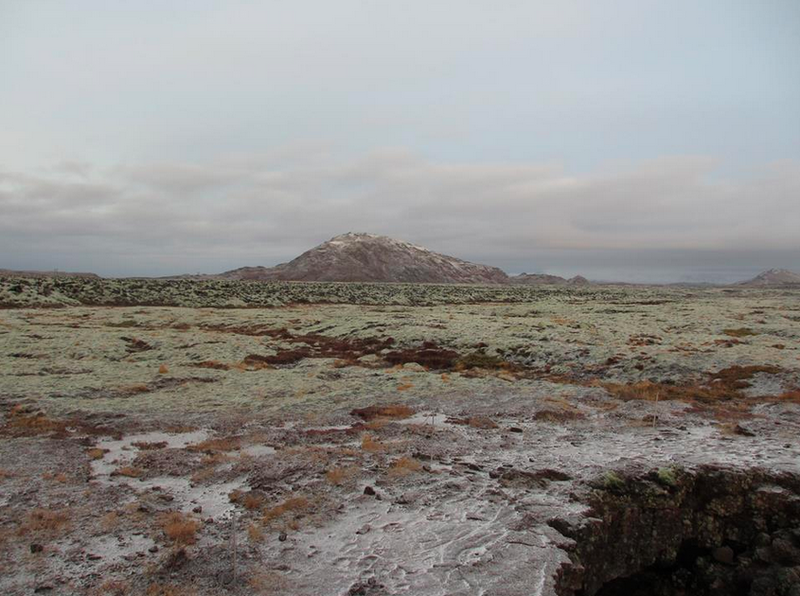 Between the spongy moss-covered rocks under our feet and the fresh powder of snow that fell steadily on our heads, it was like something out of a fantasy. Maybe it's the only child in me, but when I'm lost in contemplation, I want to be alone with my thoughts. Or at least feel like I'm alone. Especially in nature, when the majesty of the landscape can be so easily shattered by hundreds of tourists elbowing each other to snap a photo. But here? Beside this particular crevasse? It exists for private contemplation. Could we have easily lost our footing on the snow-covered moss and slipped into the abyss with no one to hear our screams? Sure. Lucky for us, igneous rock provides great traction. Can you imagine living crouched in pitch darkness all the time? Welcome to life as an icelandic convict in olden times. If a convicted criminal was granted a reprieve from execution, they could still be pursued by their victims and their victims' kin. The catch is that in Iceland, everyone is family. So the convicts took refuge in the caves, where law abiding icelanders refused to go for fear of trolls. The convicts eventually went blind from the absence of light and subsisted on whatever hapless animals wandered in. On a more uplifting note, the view when we emerged from the mouth of the cave was spectacular. (If you look closely, you can spot the cave's entrance in the bottom right of the photo.) Journey to the center of the earth, anyone? Side Note: if you're claustrophobic but still curious about lava caving, I really recommend Arctic Adventures (and guide Gilly, in particular). He's an expert at leading people with a fear of tight spaces. And if you really can't bring yourself to go in that cave, the view from outside the cave alone might be worth the trip. Snorkeling through the continental fissure that divides North America from Eurasia-- in 2 degree water. The good news is we were outfitted with thermal underlayers, a 'bunny suit' (essentially a down sleeping bag with legs), and a dry suit. Dry suits keep your body 99% dry. Only our hands and heads came in direct contact with the water, and those were protected by neoprene. Bottom line: I'm glad we did this, but I wouldn't recommend it for everyone. You've got to have a fairly intrepid spirit and a high tolerance for short periods of discomfort. Ask yourself if you're willing to lose an index finger to see some truly awesome geological formations. Hands down, my favorite activity was our trip out to the Solheimajokull Glacier. (In fairness, the weather may have played a small part. It was the only sunny day we had all trip.) 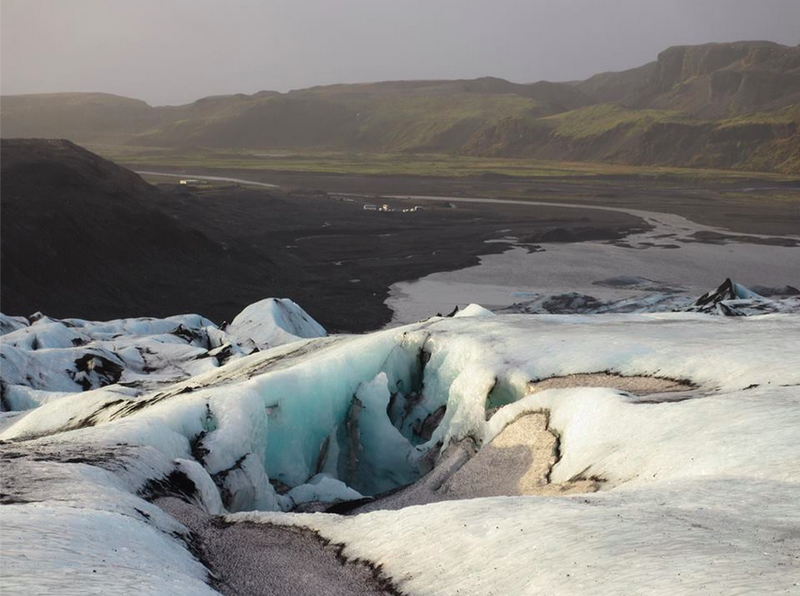 The glacier itself is massive, surrounded by lush green mountains and dusted in volcanic ash. It took us about 10 minutes to adjust to walking in our crampons. Of course, once we felt comfortable walking uphill, we remembered that downhill is the real challenge. No matter how many hikes I go on, I always seem to conveniently forget that part. Selective memory? After a few hours of trekking, while our perpetually smiling (and generally lovely) Swedish guide explained the history of the glacier, we reached the ice cap. Then it was back down in search of a vertical surface for climbing. Have you ever been ice climbing? It's hell on your toes (you basically slam your feet into the ice as hard as you can so that the spikes on the front of your crampons catch), but it's was also the most fun I had all trip. The first time I tried, I couldn't quite reach the top. But the second time, I touched the carabiner just as I thought my arms were about to give out. (Ok, truly, our safety guide, Oskar, more or less pulled me the last 3 ft. But I'm going to call it a win.) We were all feeling pretty pleased with ourselves. That is, until Oskar traipsed up the wall without so much as an ice pick. Hmm. A goal to work towards. 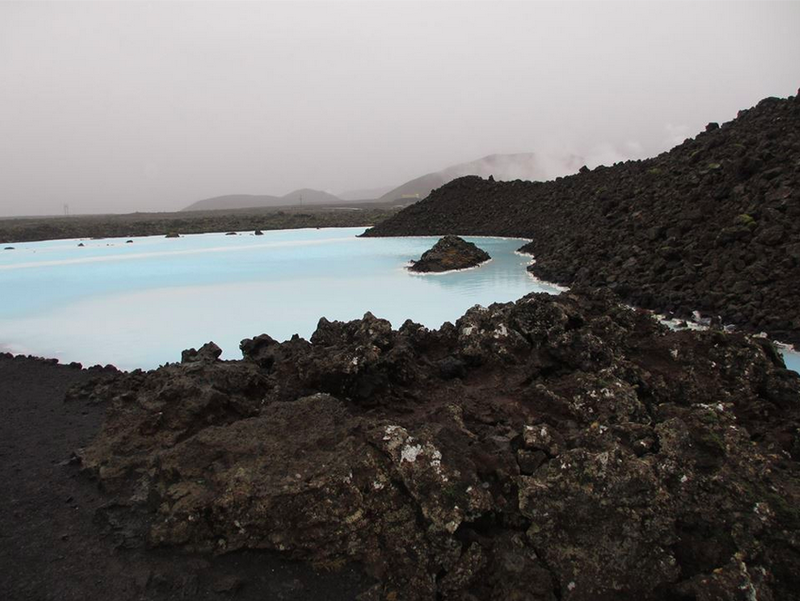 Because of the Blue Lagoon's proximity to the international airport, it's common practice for travelers to go directly from the arrivals terminal to Iceland's famous geothermal baths. I can understand the temptation-- the flight from JFK to KEF is disorienting at any time of year. It departs at 8pm, like a typical overnight flight, but only clocks in around 4 1/2 hrs. Much too short to qualify as a night's rest. We took a different tact and planned the Blue Lagoon for our final day in Iceland. Boy, was I glad we did. My travelmates and I woke up achingly sore the morning after our ice climbing adventure. (In retrospect, not surprising. While I like to consider myself active and physically fit, I don't often ask my arms to hoist my entire body weight up an 20 ft wall.) The Blue Lagoon's warm, sulfuric water and series of saunas was the perfect cure for my tired muscles. You guys, I cannot express how clean the facilities are. This is nothing like your standard public bath house. No no. We were among the first guests to arrive in the morning and I swear it looked like they'd completed construction the moment before we walked in. The locker rooms were squeaky clean and dry. Their technology is pretty awesome too-- you're issued a waterproof bracelet that functions as your admission, charge card and locker key while you're enjoying the spa. Brilliant. + Kex Hostel is high-design for small budgets. The lobby, which comprises the front desk and lounge area for guests, as well as a bar/restaurant open to the public is very eclectic cool. We opted for a private 4-person room (two bunk beds!) with a miraculously clean shared bath, but they also offer traditional hostel accommodations at a lower price point. The 'dorms' are divided by gender and located near shared baths and kitchenettes. Wi-Fi is strong, but only accessible in the lobby. The Kex bar is popular with Reykjavik's hipster crowd, so it was fun to wind down with a beer at the end of the day and take in the local scene. We even got to catch an 'electro fury' concert in Kex's event space. And if you're too exhausted the venture out at the end of the day (see sore ice climbing muscles above), the hamburger is very tasty indeed. + Caffeine and waffles at Mokka Kaffi is a great way to recover from jet lag. Unlike most Reykjavik eateries, this one opens early! Be sure to check out the locals-- it's a gathering spot for heavily-bearded men in traditional wool sweaters to read the morning papers. + We booked our outdoor activities through Arctic Adventures. It made financial sense to stay all 4 nights in Reykjavik and we city kids weren't particularly keen on driving a rental car over icy winter roads. Artic Adventures picked us up at our hostel every morning and deposited us there every night. Unlike the big tour companies (namely, Reykjavik Excursions and Iceland Excursions), Arctic Adventures takes you out in small groups and emphasizes physical activity. We especially came to love their fun, quirky guides. + Bunk Bar, on the main drag Laugavegur, is a cool place to sample Icelandic beers (I liked the Viking beers best) or try a Bjork cocktail-- made with birch liquor. + For a knockout, budget-busting meal try Fish Company's 'Around Iceland' tasting menu. Out of this world. + Save some open-to-buy for the airport. Strange as it sounds, KEF has really high-end shopping. Epal is especially awesome for scandinavian design goodies. I blew my last krona on this adorable cup by Icelandic ceramicist Kristin S. Gardarsdottir-- I love it! + I did manage to squeeze in one architectural field trip, despite our limited time in Reykjavik. The Nordic House, designed by mid-century legend (and a personal hero) Alvar Aalto, sits on a plot of marshland on the outskirts of the city center. Opened in 1968, the Nordic House is an organization created to encourage cultural discourse between Iceland and the other Nordic countries. (Interestingly, it's the only built work in Iceland designed by an internationally acclaimed architect.) The interior space comprises a library, exhibition space and restaurant Dill. My favorite part was wandering the Artek furniture-filled library and admiring how effectively Aalto crafted private space for library-goers, within the open plan public space. a wool hat, water-resistent gloves and SmartWool socks. I was much happier on days when I remembered to throw an extra pair of socks into my kanken. Please don't hesitate to email me if you're planning a winter trip to Iceland! I'd love share more of what we learned.